My mom and her mom were natural redheads. I inherited their pale skin but not their copper locks. I was a towhead (white-blond) until high school when I accidentally permanently dyed my hair pink for crazy hair day (in the days before pink hair was actually cool). After that I changed my hair color with the season to whatever caught my fancy. I generally went red in the fall but for the last three years it's stayed various shades of rust. It suits my nearly transparent inherited skin. My kids were both born with pale golden hair which turned to a dirty blond around age three, just like their Dad. During the summer, their hair lightens quite a bit. They seem to have inherited both Michael and my Dad's darker, tanning skin. They turn a buttery bronze color and look just like the So Cal beach bums they are. The one thing they've never had was a sun burn. And this is only because I happen to be the sunscreen police, applying it whenever we go out, year round despite hearty protests. I personally use it like other people use hand lotion, because I turn pink after just seven minutes in the sun. Unfortunately, on the 4th of July when we walked over to our local park, none of us applied sunscreen. I got my face because my face lotion contains an SPF of 30, but that was it. We were in the sun for about two hours, and most of that time we stuck to the shade. However, it was enough sun for all of us to get a burn. I lamented the damage done to Nathan and Ben's still baby-soft skin and spent a miserable night myself, trying to get comfortable while my chest area was on fire. 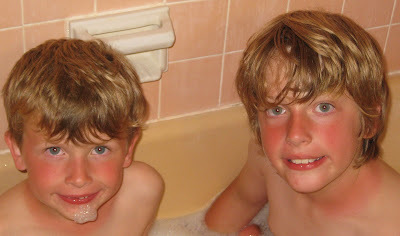 The next couple of days the boys' faces turned more tan than pink, but my chest just got worse. It started looking like melting molten lava and I had incessant, persistent pain like I've never experienced, despite using every over the counter and out of the garden/kitchen remedy known to man (or at least the Internet). Michael and I went out to see Monty Python's Spamalot and even the non-stop laughs weren't enough to distract me from the fact that this was an incredible amount of pain for just a six by four inch patch of skin! So the next day I took myself over to Urgent Care where the dark-skinned nurse and the dark-skinned doctor both gave me quite a lecture! Oh, and a shot, three oral prescriptions, and two topical prescriptions for what ended up being a very bad and infected burn. Time heals all wounds, but prescription pain medicine helps too! It's now been two weeks and the skin is raw and pink and very itchy and probably scarred, but the pain is gone. Of course, my vigilance with the sunscreen has risen to heights never before seen! The boys get sprayed down as part of the morning routine, plans to go outside or not. I was warned that those pesky UV rays don't know how to stay outside (remember those Stop Smoking ads that asked how smoke stayed in the smoking section?) and can zap you in the comfort of your own home. True or not, I will not be taking any chances. Pain has a way of teaching us lessons in far more effective ways than simply reading about danger!